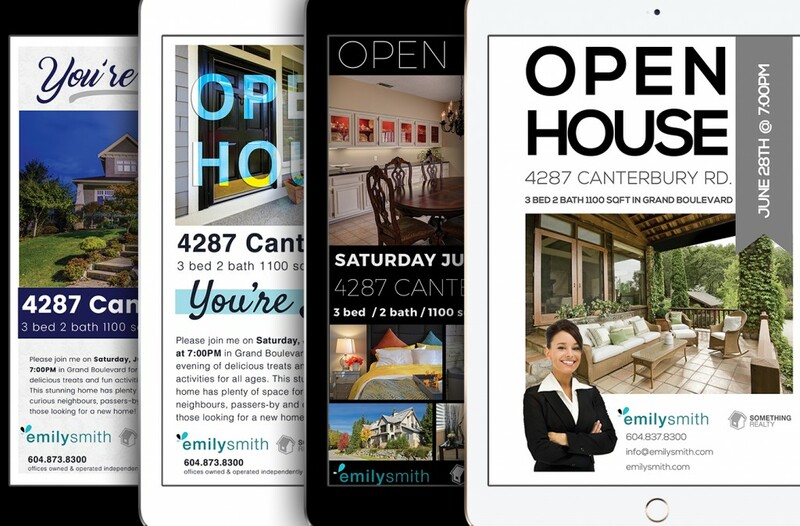 Increase attendance at your next open house by sending one of these four beautiful open house invitations to your list – digitally or physically! We know that your brand is unique and that one size doesn’t fit all. That’s why our design ninja, Roxanne, has created four different open house invitations for you to customize and send out to your list. There is a contemporary design, modern design, simple design and traditional design. We’re sure that you’ll find one that works best for your brand. One great thing about these invitations is that you can send them out via email or have them printed on nice paper and mailed out to clients! [-_-]~~~ Ninja Tip: Include a handwritten note with the invitation for an extra personal touch! Everything on these open house invitations is customizable, including the logo, the listing photo, the headshot, the colours and the text. Peek at the examples below, and try to visualize how they’ll look when you make them your own! In order to receive your free, customizable open house invitations, simply subscribe to The Dojo mailing list using the form just below the notes. Your files will automatically be sent to your inbox upon confirmation! If you are not familiar with graphic design tools such as Adobe Photoshop, please contact a graphic designer to customize these files for you. -Please allow up to 20 minutes for your file to arrive. -Please subscribe to receive the files, even if you are already a member of The Dojo mailing list.